BELLINGHAM – Calling the series of short stories written by his eleven-year-old daughter featuring Overwatch characters “extremely alarming” and paralyzed with uncertainty about what to do in response, local father Tom Greenfield clutched the offending pages tightly in his hands and shook them frantically at his wife. 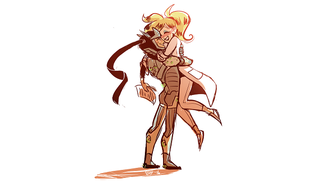 The stories, or scenes more accurately due to the lack of any identifiable plots, graphically detail romantic interactions between Overwatch heroes Genji (a Japanese cyborg) and Mercy (a Swiss medic). “I just don’t see what the big deal is,” added Mrs. Greenfield. Suddenly the unmistakable pop of a revolver pierced the air followed quickly by the sickening thud of body armor. “GENJI!” she cried out. Mercy raced as fast as she could toward the sound. Her heart ached through her breast. When she found him he lay crumpled, functional but just barely. Mercy threw herself onto his cybernetic body and set to work reviving him, gently stroking his chest. Genji’s body spasmed with coughs. He moaned softly. Mercy felt his strong metal hand caress her back and pull her body even closer to him. She throbbed at his familiar touch, shifting her hips against him. “But then how can I tell you that I love you?” he asked. Mercy pressed her lips firmly against her fallen hero’s mask. “Why can’t you take this seriously, Lori?! What kind of a mother are you?” her husband accused. Mr. Greenfield stiffened at the rebuke but then sank down deflated into a chair next to his wife. “I know,” he replied, exasperated. “And I do.” Mr. Greenfield put his head in his hands and sighed deeply. Mrs. Greenfield smiled knowingly and placed a hand dotingly on the back of her husband’s neck.